Southern Rockies Nature Blog: Escape from Stalag-Dachs 17! 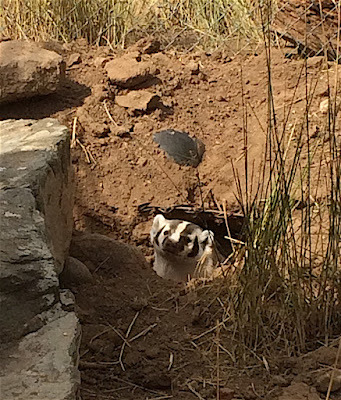 Over at the rehabilitation center, Gus the badger has been working on his tunneling technique. He started with the boulder visible on the left. The swift fox that was released last April had a small den underneath it — Gus spent a couple of months enlarging that sett (den), adding more entrances, and even dragging in a small log — a roof prop? But then his ambition grew: it was time to tunnel for freedom! His enclosure is made from chain-link fence, and the mesh comes in horizontally for about thirty inches on each side to deter digging. Hah! Gus located the edge (you can see it behind his head), and dug under it until he reached the outer wall. Then he kept digging. The rehabbers are philosophical about his escapes. The exit is in a meadow, and they figure that digging a tunnel is part of the rehab process. Gus still comes back for meals — frozen rats, etc. But he is developing an adult personality, a more aggressive one. Grown-up badgers are the opposite of cuddly. The only question seems to be whether he will be somehow caught and relocated to a good release site, or whether he will release himself. UPDATE: Around the 10th of August, Gus started leaving some of his frozen mice uneaten. Evidently he was feeding himself. By the 16th, he had been missing from his enclosure for several days and was presumed to be living on his own. Awesome! Love your blog - had 'lost' it because I haven't been checking rss!